Ignore your sailboat mast rigging at your peril! If the mast rigging on a sailboat fails, then you're going to lose your rig unless you act quickly, or are extremely fortunate. Rigging the mast is clearly something that's best left to the professionals, although checking and maintaining the rig is well within the skills of most sailors. And it's just as well that it is, as regular rig inspection and maintenance is essential. 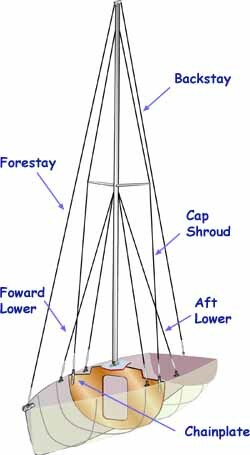 Mast rigging, or standing rigging as it's known, comprises the backstay and the forestay to keep the mast in place longitudinally, plus the masthead 'cap' shrouds together with the lower shrouds to secure it laterally. But it's not normally the stainless steel wire shrouds and stays that fail; it's the fittings that are associated with them, particularly those used to attach the shrouds to the mast. It's vital that the mast rigging is free to articulate at each end of the shrouds and stays to accommodate the natural flexing that will occur. Otherwise, if misaligned or restricted in movement at all, stainless steel rigging will quickly fatigue and fail. For this reason the lower ends of all shrouds and stays must be fitted with toggles. Aloft, toggles are only required on the forestay (and cutter stay, if fitted) to take up the lateral movement caused by the headsail and staysail. On multi-spreader rigs, discontinuous rigging terminates at the spreader ends rather than on deck. As a result it uses less material and therefore reduces weight aloft, plus the better articulation also reduces metal fatigue and simplifies the job of tuning the rig. 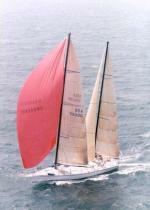 Fractional rigs and cutter rigs are normally associated with running backstays, a contrivance viewed with some disdain by many cruising sailors. Aft intermediates are only a few degrees off vertical, so to get any meaningful aft component of force they must be highly tensioned. This puts a lot of compression on the mast and additional load on the chain plates. Through-bolted tangs and eyes are the most secure method of attaching shrouds to the mast and T-bars and stem ball probably the least. Alloy castings - as often seen in masthead assemblies, goosenecks, spreader sockets and boom kicker attachments - are always suspect. There may be voids or other defects within, which are totally invisible from the outside. For these fittings, welded fabrications are more reliable than castings. 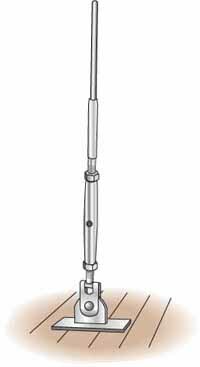 Rigging screws - or turnbuckles as our American friends call them - are used to tension the standing rigging, although hydraulic rams may be used on the backstays of larger vessels. Very often the central body part and the stud ends are machined from stainless steel, which is not quite as sensible as it may first seem. Turning these under high loads can cause the threads to gall and seize together, but this risk can be avoided by using either all bronze components, or a bronze body and stainless studs. Some years ago I was sailing my Nicholson 32 single-handed from Moraira on the Spanish Costa Blanca to Ibiza, one of the Balearic Islands in the Mediterranean. Conditions were perfect, the sun was shining, not a cloud in the sky and Jalingo II was bowling along nicely. I was idly watching my mate 'Arry' doing his thing. 'Arry' being the Aries self-steering gear I hasten to add. A periodic glance ahead and something shiny on the foredeck caught my eye. What was it? Oh my God, a clevis pin! A most urgent inspection took place. The rig was still there, which was a good sign. The windward shrouds were taut and there was nothing flapping on the leeward side. A close inspection at deck level revealed that everything was as it should be and the binoculars confirmed a similar situation aloft. Much relieved, I could only assume that a higher authority had decided I was having far too much fun. Or, maybe it had fallen from my spares kit. Either way it reminded me just how much the rig depends on these small items. Love your clevis pins and protect them. 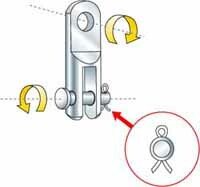 Clevis pins are designed for shear loads, not bending, so toggles must fit snugly around them. Left to their own devices they will wriggle out, with calamitous results, so they must be securely retained. 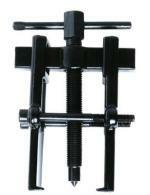 Split pins - cotter pins in the USA - are good provided they're installed correctly. The temptation is to open them too wide. Split rings are a poor substitute. If subjected to chafe - a flogging sheet for example - they'll deform, rotate and will very probably fall out - whereupon, to quote an old English nursery rhyme, down will come baby, cradle and all.